How to Develop Mobile Apps Faster and Smarter with APIs? Digital technologies and customer experiences have evolved rapidly in recent years. New approaches and patterns have emerged to better support enhanced and seamless digital experiences. More importance is given to the integration between the client and server today than ever. For this digital transformation to take place, developers use APIs. 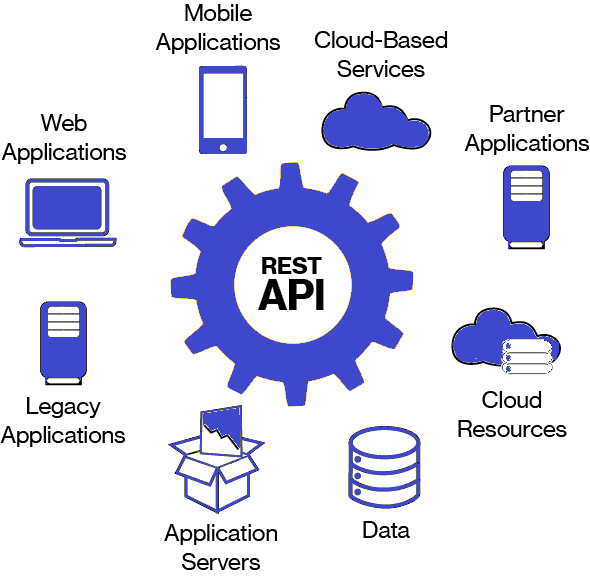 What exactly is an API? It is something that allows developers to implement functionality or bring in data from third-party sources. APIs support integration by allowing two applications to communicate with each other. With an API, your mobile application is technically still functional. Although, it isolated from the rest of the software world. Like for e.g. if you are a hotelier with a website, you’ll want to show a map so as to guide visitors to your restaurant. You can, of course, create a custom map for your website, but there are Google Maps available which are more reliable and have better functionalities. Plus, Google Maps are familiar for users to operate. Therefore, you can use the Google Maps API to display a little piece of it on your website. Or if you have created a portal which needs your users to create an account to log in. You can create a separate sign-in form or you can give them the option to log-in via Facebook, Twitter or other social media APIs so their data is automatically synchronized and they don’t have to fill-in additional forms. How can APIs be used for faster mobile application development? Digital transformation needs an environment that encourages versatility, adaptability, innovation and agility. This means that your business processes, technology and the people involved (employees, customers, partners etc.) need to work together. APIs are essential to creating such an environment. They connect your stakeholders with your back-end services and allow new capabilities to be built on them. Adopting an API management solution allows your mobile app development company to design, create, publish and manage APIs that gives your company the agility it needs. Digital transformation can be prompted in an ecosystem that is agile and easily adaptable. Your company needs to have the ability to create new services- either from the beginning or by combining existing services in order to fulfil customer expectations and demands. APIs can be your composable digital assets that leverage the services you offer and give needed exposure to your users. Due to its composable nature, the APIs can give you the desired agility by piecing your assets together to make innovative solutions that meet the evolving business needs. Your API management solution needs to allow you to design, publish APIs in an iterative manner- while giving you full control of the API lifecycle. This helps decrease the time spent on creating your APIs and assist you to deliver your services faster. Approaching development from an API perspective enables you to create different software components with greater attention to their integration. Furthermore, since APIs are sets of clearly defined rules, applying API for your business will make all development teams use the same rules and formats- such approach will make the app code more streamlined and transparent. Legacy applications are those systems that are deeply embedded in your organization that you cannot do without. Digital transforming doesn’t necessarily mean you need to get rid of them. By making your legacy systems API accessible you can leverage their capabilities and use for your new solutions. API management solution helps overcome the challenges that come with revealing certain services of your legacy systems by upgrading out-dated security protocols to modern, user-friendly ones. Customers expect easy access to your services. Therefore, to ensure the same, your services need to be available any time on various platforms. APIs can make your services accessible on channels that customers regularly frequent including Facebook, Instagram or even chatbots and virtual reality etc. Moreover, API management solution will make your APIs highly visible and consumable- allowing your customers access to your services anytime and anywhere. What are the best practices to use API for fast and smart mobile app development? Like mentioned above you can leverage your existing legacy application, however, if that system lacks fine-tuning and performant RESTful API then you need to invest both up and down the stack. In all your digital experiences there have always been those applications you wish were faster and more responsive. In most cases, though, the trouble can be traced back to bottlenecks on the server. Therefore, you could build on your existing legacy application to make it the fastest, but it is all a moot point if it sits on top of slow APIs- it will suffer from poor user-experience. In many cases, a mobile application is such that it needs to make several service calls in order to complete a transaction on a given screen. This is an issue. When you create API’s to support a front-end, ensure that there is only one API call per screen. Increased service calls result in limiting the app responsiveness and will exhaust the device’s battery life. You can build efficient API endpoints and utilize the local cache from the device to fill in the user experience externally from the API calls needed to make each screen. As more enterprise IT are prompted to invest in APIs – the high demand and the need for scalability has created the need to break up the large system into a set of small independent services. This approach is called micro-services. Troubleshooting, easier isolation and simpler deployments- a microservices architecture produces a totally decoupled API that is simpler to create, implement, maintain and consume in general. Reducing network chatter may create large API response. Limiting the client-server chatter is important but so is making sure that each API endpoint feedback only gives away the data required by the client app for the respective screen. Each change that you do in your backend can affect your API’s performance of the front-end app that expends it. Every step needs exact precision to make sure your API offers the lowermost latency possible. Nowadays, it is difficult to find a business that is not using or publishing APIs. Ad Hoc API and monitoring only result in performance issues, lower productivity and security problems. Therefore, you must consider API management solution and the above best practices as the baseline to provide exceptional digital experiences.